Ankyloglossia or tongue-tie refers to a minor anomaly in the attachment of the membrane or frenum that attaches the tongue to the floor of the mouth, which may interfere with normal function and mobility of the tongue. This article focuses on how to identify and diagnose infant ankyloglossia. Also in this article, we have discussed an instrument fabricated by the team for clear retraction and visualization of posterior ankyloglossia. Ankyloglossia or tongue-tie, refers to a minor anomaly in the attachment of the membrane or frenum that attaches the tongue to the floor of the mouth, which may interfere with normal function and mobility of the tongue. Ankyloglossia is a poorly recognized and inadequately defined condition and has been reported to cause breastfeeding difficulties, dental issues and speech problems. This article discusses assessment criterions to diagnose posterior ankylogossia and lays down treatment protocol in neonates using the Er,Cr:YSGG (Waterlase MD). ​How to Cite this article: Pradhan S, Yasmin E, Mehta A. Management of Posterior Ankyloglossia using the Er,Cr:YSGG Laser. 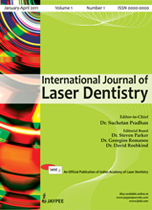 Int J Laser Dent 2012;2(2):41-46.